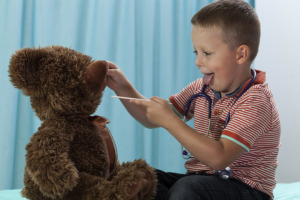 Home › About Child Life Therapy › What is Child Life Therapy? Child Life Therapists are healthcare professionals specialising in child development, with a background in education and/or other fields of healthcare. Specific play sessions focusing on procedures and useful coping skills have shown to reduce anticipatory anxiety, distress and positively impact future procedures [ii]. Procedural support and distraction provided by a CLT can also be effective in reducing patient and parent anxiety for ongoing invasive procedures [iii]. Facilitate training and support to other healthcare professionals around child development, and best practice in supporting children’s wellbeing while in healthcare. Our interactions with patients and their families are individualised, strengths-based, and support family-centred care. In the USA, Canada and many other nations such professionals are referred to as Child Life Specialists; In the UK and New Zealand they are called Hospital Play Specialists. You can find out more about our international colleagues through our Useful Links page. If you are interested in becoming a Child Life Therapist in Australia, check out our How do I Become a Child Life Therapist? page, which lists all the information you need to know.You can read what the American Academy of Pediatrics has to say about the importance of child life therapy in their 2014 Policy Statement on Child Life Services. The National Association of Health Play Specialists (UK) has also released a fantastic report in 2014 entitled The Provision of Play in Health Service Delivery. [i] McGrath, P. & Huff, N. (2001). “What is it?” Findings on preschoolers’ responses to play with medical equipment. Child: Care, Health and Development, 27, 451-462. [ii] Claar, R.L., Walker, L.S., & Barnard, J.A. (2002). Children’s knowledge, anticipatory anxiety, procedural distress, and recall of esophagogastroduodenoscopy. Journal of Pediatric Gastroenterology and Nutrition, 34, 68–72. [iii] Dahlquist, L.M., Busby, S.M., Slifer, K.J., Tucker, C.L., Eischen,&nsbp;S., Hilley L., & Sulc, W. (2002). Distraction for children of different ages who undergo repeated needle sticks. Journal of Pediatric Oncology Nursing, 19, 22-34.